For Only $23.97 Sold Out. God Rocks! expansion pack adds 35 new child friendly songs to Dance Praise and Dance Praise 2! 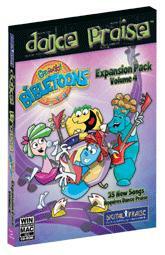 Includes hits from 6 best-selling cds from God Rocks!, including the popular Bible-based BibleToons. With 35 up-tempo songs, many with 100% NIV® scripture lyrics, this Expansion Pack will help everyone "sing, learn and dance to the Word". Each song offers 3 levels of steps, so there are over 100 new dances for hours of dancing, fun, and the opportunity to learn God's Word. The whole family will enjoy the varied sounds of God Rocks! and their four unique retro-bands - Beach Stones, Flint Rockly, Soul Stones, and Beat Rocks. Onscreen lyrics reinforce Christian messages and scripture. Integrates directly into your current version of Dance Praise.